I've been crazy busy lately. It's been quite an adjustment getting used to caring for a little one and working part-time. I've been working from home with a little time in the office once a week. This week I have to be in the office for an entire day! I don't know if I'm ready for this. Okay, I know I'm not but I think I will be okay. I will be plenty busy at work getting ready for Unite. 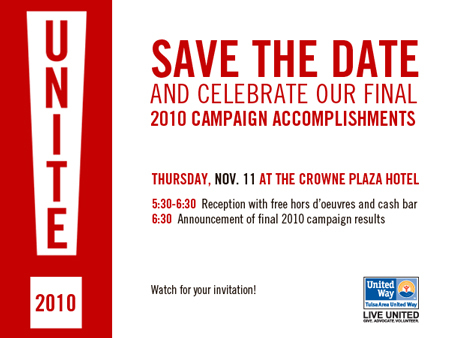 Unite is Tulsa United Way's final campaign celebration. The evening is free to the public and there will also be free hors d'oeuvres!! The purpose the event is the celebrate the campaign accomplishments and announce how much the Tulsa area gave to help support the 61 local agencies the United Way supports. 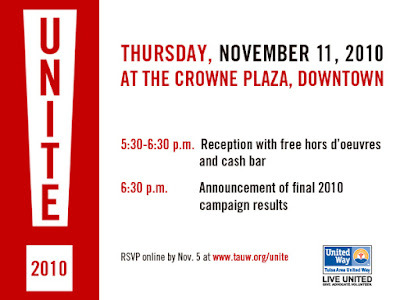 For those of you that aren't familiar with the Tulsa United Way and who it supports, here's a little help. Did you know they help fund programs for YWCA? Broken Arrow Seniors? The Salvation Army and Goodwill? They also help the Red Cross local chapter. And that's just 5 of the agencies they fund! So come out Nov. 11 and celebrate with me!! 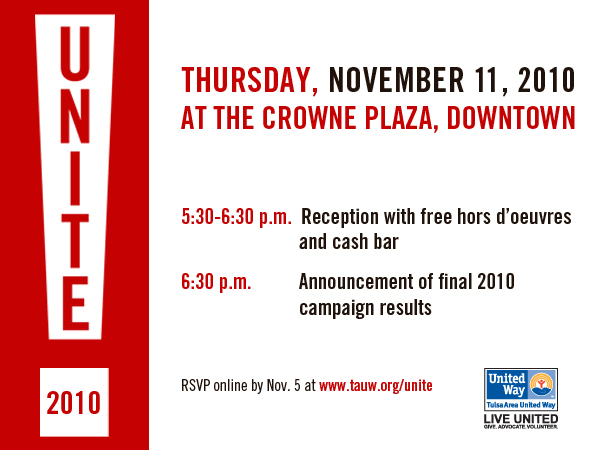 RSVP at tauw.org/unite!